I've indulged in three succulent paintings over the last few days and am as happy as if I were painting roses. For some reason I get the same enjoyment from these supple petals as rose petals. I will be traveling again for the next week. I'm not sure if I'll get a painting done to post before I get back. Don't worry about me, I'm fine, just enjoying myself... A LOT! Friends went to Michigan and photographed this cup of wildflowers they found in a sweet little general store. They thought of me when they saw them and emailed the image to me. I decided to honor their thoughtfulness with an impressionistic version of their gift. Thank you Susie and Israel. It's been a while since I've painted a sunset again, but with all the traveling I've been doing, I've seen more this summer than I see in a year. What a glorious opportunity it's been to see the sky at this time of night. A friend sent me a photo of her succulent garden, She said she planted the cabbage with them in order to have some purple in the pot. I agreed with her decision. It needed some purple counter balance the warmth of the yellow greens. Two of my favorite things to paint in one place! How could I go wrong but to paint them. For those of you who are wondering, I did not use a sponge to paint this one. I used... a couple of brushes. Yup. The Princeton Catalyst brushes were my tools of choice. I still adore them. Ahhhh, I've finished painting for other people for a while, and have three gallery exhibits hanging or at least the art is delivered and ready to hang. So here's a little warmup painting to get my juices flowing. I've shot photos of beautiful things to paint, now it's time to make some of those photos into art. This is the second piece I painted in the Grotto. It's a mosaic cake that is taller than I am. It looks like either the trees are tiny here, or the cake is huge. Well, it's huge. A month ago I went to the Botanic Gardens earlier than I'm normally out of bed. It was a beautiful summer morning with low humidity. The sun, low in the sky, cast shadows like I had not witnessed before. I was rewarded for my early excursion. I've been gone. I've actually been here, at home, but not so much in my studio. I gave myself permission to rest, to become fallow, replenish, refresh and do nothing. Nothing turned out to be preparation for three exhibits, several house portraits and commission pieces, but I'm not compelled to post. Not yet, anyway. I'll share with you the triptych when it's hanging in Wisconsin. I'll announce the shows on a different day. For tonight, I'm just dipping my toes back into the pond and sharing a rose that dazzled my senses. She will be in one of my shows. But more about that next time. When I was in Santa Fe in February I bought chocolates at Señor Murphy's Confectionary. They were beautifully decorated and fresh, because they made them on site. Five months later, I am ready to paint them. They are still beautiful and surprisingly quite delicious. Yes, I ate one of them after it was completely to my liking on the canvas. This piece will be in my show in September. I haven't posted in a couple of weeks. I've been working on commission pieces and house portraits for real estate agents to give as closing gifts to their clients. I've also been traveling. Last week we were in Michigan, and this weekend I will be in attendance at the Door County, Wisconsin Plein Air Festival. I am not one of the invited artists, but will participate in the Quick Paint event on Saturday. I know several of the invited artists, and will enjoy watching them paint for a few days. I want to thank all of you who have decided to, or are continuing to follow me since I switched from Blogger to my new site. My husband is doing the techie work to keep my art in front of you, and I appreciate your ongoing interest. I visited my friend over the weekend. Her hollyhocks were in bloom by the pine trees. The blue spruce to the left, and some other pine to the right. Her flowers, however, were white. I needed to paint color, so I gave my friend the gift of pink hollyhocks in that part of her garden. the foreground posies were almost this color, but not quite this shape. Oh, well, I'm sure she'll forgive me. It's another Art Bites paper panel, but I'm ready to move on to canvas again. I have a show coming up, for which I want to have several new paintings of chocolates ready to frame and hang. I have the goodies, just need to arrange them and prep a big canvas. I wonder how large "too large" is for a piece of chocolate? The woods, that evening, was striped with shadows and light as I walked toward the field where my friend agreed to meet me. I had been looking for morel mushrooms, avoiding the poison ivy, as I swept the forest floor with my eyes and a long stick. The light was no longer conducive to mushrooming, so I made my way toward the radiant star shape and exited my favorite stand of trees in time to see a doe and a fawn leaping through the corn. This is another little study done on the Art Bites. It's nice for thick paint like I applied here. The texture of the printed canvas doesn't show. It's been a while since I've painted for a post. I've been traveling and working on house portraits and commission paintings. And truth be told, I've been terrified of posting in my new blog space. I confess. I'm resistant to change. Okay, I hate it! I might look confident and worldly and wise, but I'm a coward when it comes to new computer-isms. I've been dragging my cute Bernie Mev covered feet... like crazy. I'm also trying a new ground on which to paint. Oh, my gosh, more new stuff! The panel is a lightweight paper-like substance called "Art Bites." I'm using it as warmup/sketching panels. My prices, now displayed on my blog, will reflect the non-canvas ground. I will always refer to this as a "paper panel." The oil paint is, as always, my beloved water-miscible oil. And it's still me, Carol Keene, painting them... here for my new blog site. There was no time to paint from the photos I shared, while at my workshop. So once I mopped up the water that flowed in through the window well into my studio this morning, gathering dozens of paintings off the floor, I painted some of the gardens my students painted. As the women discovered, I like to paint "spiky things." There will probably be more as I work through this series of knife paintings. And here, my friends, is a video of the workshop. Now that I know what is possible, I'll take better photos. The music, "Angelina," was written and performed by our friend, John McHugh. I taught a two-day knife workshop in Chippewa Falls, Wisconsin last week. The ten attendees were, for the most part, watercolorists with a willingness to learn to: #1 paint vertically; #2 paint with thick acrylics; #3 use a painting knife; and #4 paint on a black background. None of these things were at all like what they were accustomed to. Below are two photos. One is from day two of my workshop. The women are holding their second paintings. Many of them began a third or fourth — wishing for another few hours of painting time, or perhaps another day. My husband is compiling a slide show of many more of the photos I took. So look for it in the next few days. The last photo is of me with Texas artist, Qiang Huang. Qiang was teaching a workshop in the neighboring town of Lake Zurich at the Mainstreet Art Center. Since he had traveled so far, and I have followed his blog and his career for years, I stopped by during his lunch break to meet him. His oils are inspiring and Qiang is getting the recognition he so richly deserves. Director Frankie Johnson brings in the BEST artists from around the country. I've taken several workshops there. Find out more about Qiang here. Learn more about Mainstreet Art Center here. 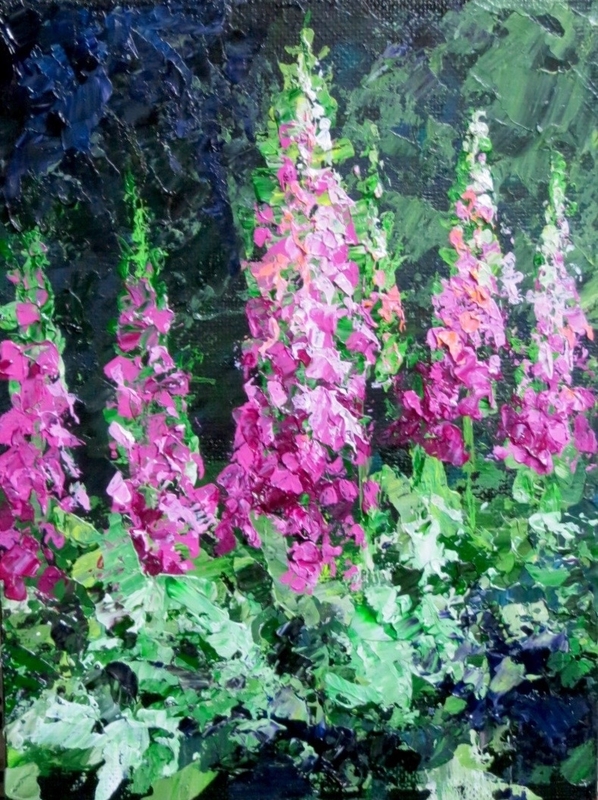 Acrylic on canvas panel, 8" x 6"
This must be one of those perfect springs for foxgloves. I've been to the Chicago Botanic Gardens twice in the past month and have been treated to a display of beauty I've not witnessed there before. I have more reference photos of these spiked plants from this year alone, than all the years I've been documenting flower gardens. How fortunate for me! Plants like this are my favorites to paint. AND this style of garden painting is one I will be teaching in my knife workshop in Chippewa Falls in about ten days. If you're in the area and interested, let me know. I may still have room in my class. This is another painting that began as a simple, single-layered piece... meaning that all the color was dropped on the wet alcohol on the first pass. It was "nice" but it wasn't fab. I disrupted the niceness of the first layer by adding multiple layers on top. If you recall from an earlier blog I mentioned that when wet ink pushes away dry ink it forms "fences." Well, the dark parts of any of these images are made by stacked up transparent colors. There is no black or so-called dark inks. They are all highly transparent, beautiful colors — just bunched up on top of one another to form dark.